wendy house » Blog Archive » institutional violence or a ticket to Kansas? This scribble was published on Sunday, April 17th, 2011. You can follow any banter on this scribble with the RSS 2.0 feed. You can share your inspired musings after typing the anti spam word near the bottom of the page. But no Pinging because its too naughty. 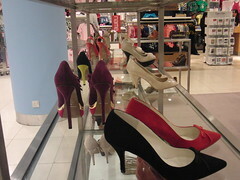 I’ve noticed that among fashion victims, the height of heels seems to be increasing. You’re starting to see some spectacularly unstable varieties. I’m fond… maybe over fond of a hairy tweed suit together with a stout pair of brogues to carry the whole thing off; but it takes years of practice to be comfortable in such togs. Tweed can be very scratchy, and even a Cheaney brogue needs to be gently broken in if one wants to avoid blisters. I remember once in Edinburgh, I forget which street, when a fine pair of newish oxbloods brought up a blister on my heel the size of an egg yolk… if only I had the presence of mind to have blamed some section of society for my discomfort. Talking of the complicity some have with the evil that is the fashion industry; I was reading with incredulity bordering on apoplexy that Mrs V. Beckham walks out with a $19,000 bag on her shoulder… as the room and my newspaper came back into focus I read on to find the dizzy bint, whose column I was reading, marvel at Mrs B for her self-denial when a Birkin crocodile leather bag fetched in at only $37,000. I imagine those targeted for the near ubiquitous, rigorous enforcement of… dying of hunger, thirst, or the lack of vital dugs hobbling miles, even in high heels, for what that kind of money might provide. … it should of course read: – vital drugs. My error is purely Freudian.